The Village of Pugwash - Thinkers Lodge - Beautiful, historic venue for weddings, conferences, and retreats in Nova Scotia, Canada. 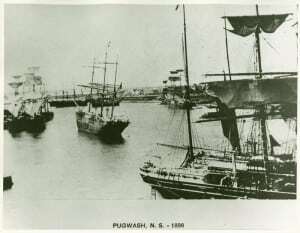 The name Pugwash is probably derived from the native Mi’kmah name Pagwecht or Pagweak meaning shallow water. The Mi’kmah came to the area for the abundance of fish and waterfowl, but there is no evidence that they established a permanent settlement. In 1697 Pugwash became part of a seigneurial grant awarded to a French nobleman Pierre Noel Legardeur Tilly. It is unlikely he ever visited, however Acadians settled in the area until their expulsion in 1755. We know very little about the Acadians. It’s possible there are in the area remains of Acadian dykes and it would be interesting to do some archeological digs. United Empire Loyalists, who had fought on the side of the British crown, came to Nova Scotia after the American Revolution. Many of them were given land grants in Canada. Two brothers, Stephen and Abraham Seaman, were given grants in the Fort Lawrence area. They purchased land around Pugwash Harbour from three Mi’kmah. Stephen Seaman acquired 400 acres on the east side of the harbour and his brother Abraham Seaman acquired 400 acres on the west of the harbour, all for £5. The first house in Pugwash on record was built by Stephen Seaman in 1807. Stephen Seaman had financial difficulties and he lost this land in an auction in 1812 to some lawyers, who were land dealers. Stephen was not informed of this auction and spent many years petitioning for some compensation, which he finally was given. Part of the Seaman land was sold in to David Sampson Pineo in 1818, and another part to Oliver King. David Pineo then sold part of his land to Joseph Black. 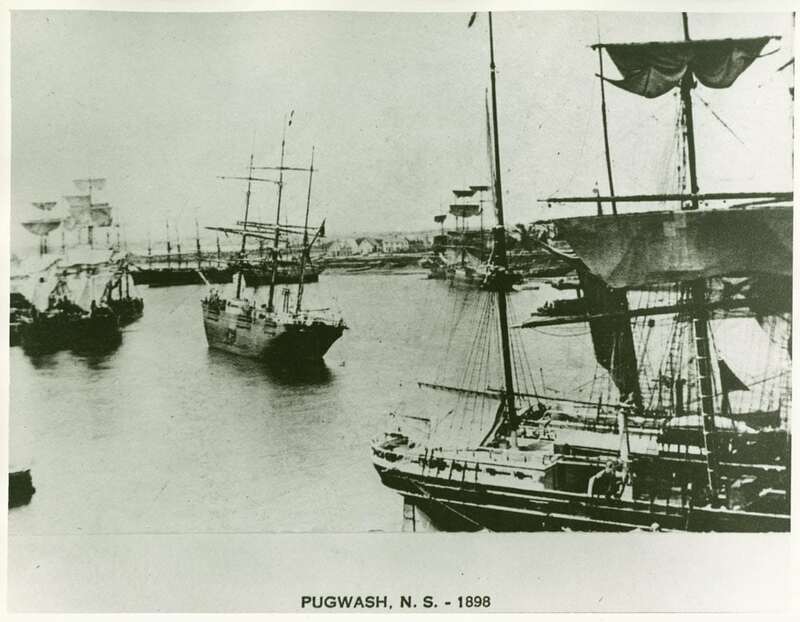 Pugwash developed rapidly because of the fine timber stands within easy reach for shipment overseas, and the beginning of a boom in shipbuilding. On September 27, 1826 a gtoup of citizens called a public meeting to have the name of the village changed as they considered the name Pugwash to be “uncouth” and not suitable for an up and coming village. A declaration was made that the name Waterford be substituted in lieu of Pugwash, and that “most prompt and effective means to be taken to render the name Waterford to be well known and established”. The name Waterford stuck as a name from 1827 to 1829. By 1830 the name had reverted back to Pugwash. Shipbuilding became the major industry for Pugwash from 1837. The harbour was busy with import and exports. It was recorded that 18 sailing ships were often seen in the harbour at one time. In 1845 James Black plotted and arranged the layout of lots and streets that became the core of the present day village. He wanted the development of the village to more orderly, and to be diverted away from the area around Crescent beach. In 1859 a ship built in Pugwash, called the George Hendersen, sailed out of Pugwash Harbour to New Zealand, carrying a number of Pugwash and Gulf Shore families including the ship builder himself, Levi Woodworth Eaton, The captain was Levi’s son George Eaton. The journey took over four months. By 1871 the population had expanded to over 3,000 (three times the current population) There were four hotels, a temperance house, six churches, a Masonic lodge, a tannery, two blacksmiths, three physicians and three teachers. Shipbuilding began to decline in the 1870s but did not cease until 1919. Pugwash went through an economic decline and even the railway line which was built with a spur into Pugwash in 1889 did not give the expected boost. Fires took many tolls on Pugwash. There were major fires in 1877, 1890, 1898, 1901, 1928, 1929. The last fire of note occurred on May 12, 1929 when 35 buildings were consumed. After this fire, Cyrus Eaton bought Pineo Lodge (now known as Thinkers’ Lodge) and the land adjacent to it, which is now Eaton Park. The Pugwash Park Commission, which owns and administers the Lodge, was established in August 1929 as a non-profit corporation by an act of the Nova Scotia Legislature. Cyrus Eaton employed many of the local people to transport the soil from a hill by the wharf (which can be seen in earlier photos of Pugwash) to fill and build up the land for the park. 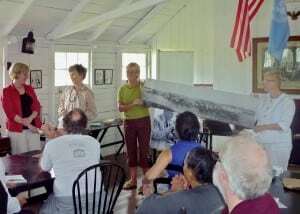 – From a discussion led by Vivian Godfree of the North Cumberland Historical Society at The Lobster Factory on July, 10, 2010.